This page will walk through angular 2 @ViewChild() example. @ViewChild() decorator configures a view query. @ViewChild() decorator can be used to get the first element or the directive matching the selector from the view DOM. @ViewChild() provides the instance of another component or directive in a parent component and then parent component can access the methods and properties of that component or directive. In this way using @ViewChild() a components can communicate with a component or directive. In a parent component we can use @ViewChild() for components, directives and template reference variable with ElementRef or TemplateRef. To use @ViewChild() we need to pass child component name or directive name or template variable as an argument. 1. Suppose we have a component named as StopwatchComponent then within a parent component, we use it as follows. The selector of the StopwatchComponent will be used in parent component HTML template. 2. Now suppose we have a directive CpColorDirective, then we use it as follows. The selector name of directive CpColorDirective will be used in host element of DOM layout in parent component HTML template. 3. Now if we have a template reference variable defined in parent component as given below. Then we can use title template variable with @ViewChild() as given below. In the same way we can use TemplateRef with template reference variable. On this page we will provide @ViewChild() complete example with component, directive and template variable. We will also provide example to use multiple @ViewChild() in parent component. Now let us discuss the example one by one. @ViewChild() can be used for component communication. A component will get instance of another component inside it using @ViewChild(). In this way parent component will be able to access the properties and methods of child component. 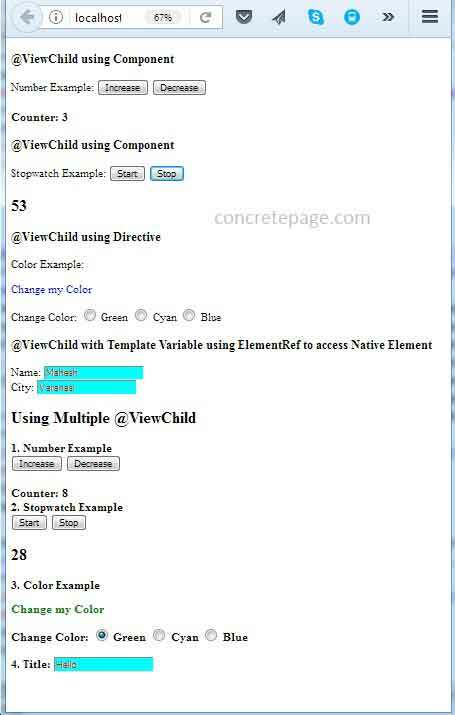 The child component selector will be used in parent component HTML template. Now let us discuss example. In this example we will increase and decrease the counter using two buttons. The counter will be from a child component. Increase and decrease button will be inside parent component. We will communicate parent and child components using @ViewChild() decorator. First of all we will create a component where we will write methods to increase and decrease counter. Now we will create the instance of NumberComponent in our parent component using @ViewChild(). We will observe that we are able to access the methods of NumberComponent in NumberParentComponent. We will use selector of NumberComponent in HTML template of NumberParentComponent. As usual both components NumberComponent and NumberParentComponent need to be configured in @NgModule in application module. In this example we will create a simple stopwatch. We will create two components, one of which will contain the functionality of stopwatch and second component will instantiate first component using @ViewChild() decorator. Find the component that will contain the functionality of simple stopwatch. Now we will instantiate the above component using @ViewChild() in the following component. We observe that we are able to access the methods of StopwatchComponent in StopwatchParentComponent. Now use the selector of StopwatchComponent in the HTML template of StopwatchParentComponent. @ViewChild() can instantiate a directive within a component and in this way the component will be able to access the directive methods. Here we will create a directive that will contain the methods to change the text color of the host element of DOM layout. Find the directive. AfterViewInit: It is the lifecycle hook that is called after a component view has been fully initialized. To use AfterViewInit, our class will implement it and override its method ngAfterViewInit(). Now create the component, that will instantiate CpColorDirective and access its methods. In the HTML template of component a host element will use directive. As usual both component and directive need to be configured in @NgModule in application module. @ViewChild() can instantiate ElementRef corresponding to a given template reference variable. The template variable name will be passed in @ViewChild() as an argument. In this way component will be able to change the appearance and behavior of element of given template variable. Find the HTML template. In the above HTML template, we have two input boxes and their template reference variables are #name and #city. We will instantiate corresponding ElementRef using @ViewChild() as given below in the component. A component can use multiple @ViewChild() decorator. We have already seen in the previous example of @ViewChild() with template variable where we are using multiple @ViewChild() decorator. Here we will combine all our above components and directive and template variable for multiple @ViewChild() decorator demo in a parent component. 2. In our angular CLI application, replace src folder. 3. Run ng serve command.